I guess that not so many people really expected that the target day of the 1st of June might be the actual release day. The day was mainly a psychological trick for us to finish all the little fixes and not to start any new projects, so we might be only week or two late instead of months. We started the first multiplayer play-tests last week, but they didn't last long. After the first hour of connection issue fixes, the game desynced every 15 seconds. The process of determinism fixing that we first experienced when stabilizing 0.11 is now well known to us. With the tools we prepared and partially explained in friday facts 63, we were able to identify and fix determinism issues much much faster than before. It took just a few days compared to several months back then. The last playtest day was 2 days ago, and we were able to play a game where Linux, Mac and Windows players were all present. It lasted a few hours and no major issues were found so we are getting there. I also have to admit, that the discovery of slither.io stole approximately 2 days of our dev time, as the game is really really great :) So if you can't wait for Factorio release, I advice you to try the game in the meantime. If the further playtesting goes well, the release could happen next week, but you never know. The information about the mod portal is brought to you by Martin, the train guy and recently also the mod portal guy. The mod portal is a long awaited feature and it is finally happening! 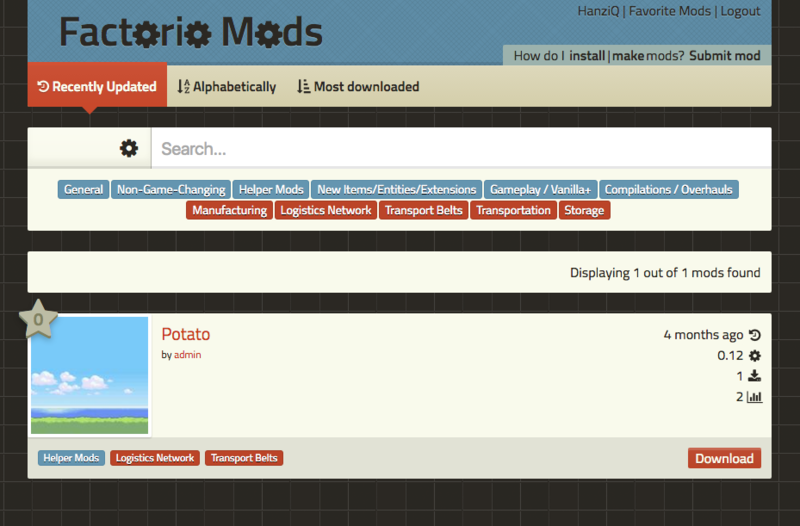 With the release of 0.13, we will be launching the mod portal website, along with an in-game integration. The base of the project was created by the original creator of factoriomods.com. 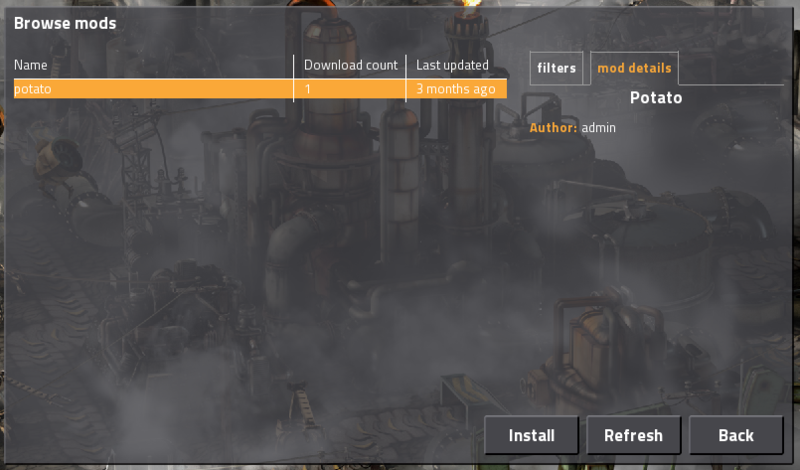 The mod portal can be viewed by anyone, but you will have to log in with your factorio account to download mods, same goes for the in-game version. Mostly due to lack of time and the size of the project, it is not in a finished state (and will not be completely finished with the 0.13 release). 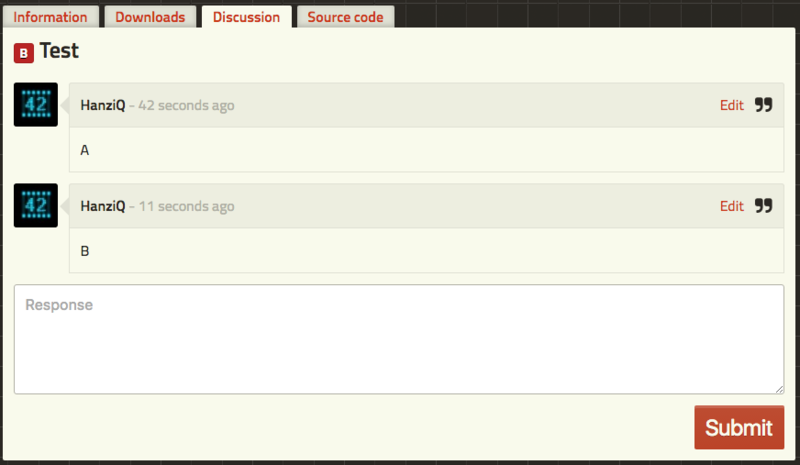 It contains many bugs and it's missing a fair amount of features that will be coming with later updates. All the graphics of the website or the in-game GUI are subject to change. Mods can be sorted and filtered, they are grouped into categories. You will be able to rate mods, probably using a 5-star scale and filter/sort mods by rating. Every mod has a discussion with multiple categories - announcements, bug reports, etc. This should help with the clutter we currently have on the forums. We will be requiring every mod to specify a license - either one of the common licenses (like MIT, (L)GPL, Apache, public domain) or a custom one, where you can specify the exact things people are and are not allowed to do with your content. The in-game browser allows you to do most of the important things like filtering/searching for mods, it also allows you to install a mod with just a single click, same goes for updating mods that are already installed. There are a lot of features that we want to still add to all this and they will be slowly appearing with 0.13.x patches. This is more a list of ideas, than a list of confirmed features, some of them might not be implemented. Once we were already working on the train graphics, we had to solve the annoying problem of train wheels not matching the rails in curves. This was obviously not solvable as we rendered the train wagons as one sprite. So we fixed it by drawing the wheels separately, so they can have different orientation than the locomotive itself. The result gives much more organic feeling of the locomotive movement.